Magnum Magnetics DigiMag Vinyl - (20 mil) For digital printing such as Eco-Solvent and Solvent based inks. Perfect for making ad-specialty items, business cards, fridge magnets, craft market, etc. After you make your purchase please contact us for printer profiles for our DigiMag® Vinyl (matte and gloss) solvent inkjet printable magnetic sheeting. Can DigiMag® VINYL be utilized with your printer? Yes. We recommend that you use the take up devices built in to some printers or aftermarket devices to control the path of the printed magnet when it comes out of the printer. This will reduce unnecessary strain on the printer caused by magnetic sheeting dropping to the floor unhindered. Will magnetic sheeting feed smoothly through the printer? Magnetic sheeting may require attention to slackness and tension during the printing process to assure consistent print quality. Too much slack or tension may interrupt the smooth, forward progress of the magnetic material through the printer. Does your solvent inkjet printer have a metal platen, shell, etc. to which the magnet may be attracted? If so, we recommend the creation of an air gap to facilitate printing on the magnet. For example, a .020" clear sheet of polycarbonate cut wider that the width of the magnetic sheeting and as long as required. Apply adhesive-backed magnetic strip to the polycarbonate sheet. This will allow the polycarbonate to be affixed easily to the printer and removed quickly when not required. Can DigiMag® VINYL be cut easily using the knife built into a printer? Some knives may not be hefty enough to cut the magnet cleanly and may dull quickly. Some manufacturers recommend that the knives not be used to cut magnet as a result of this. 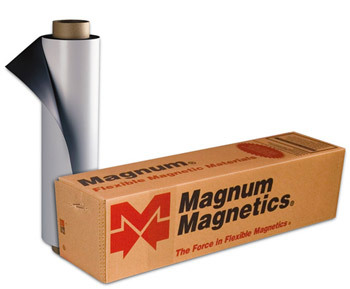 The flexible magnet itself is easy to cut by hand with knives or scissors.